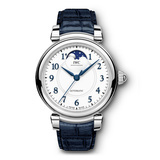 This IWC Da Vinci Moon Phase 36 (ref. 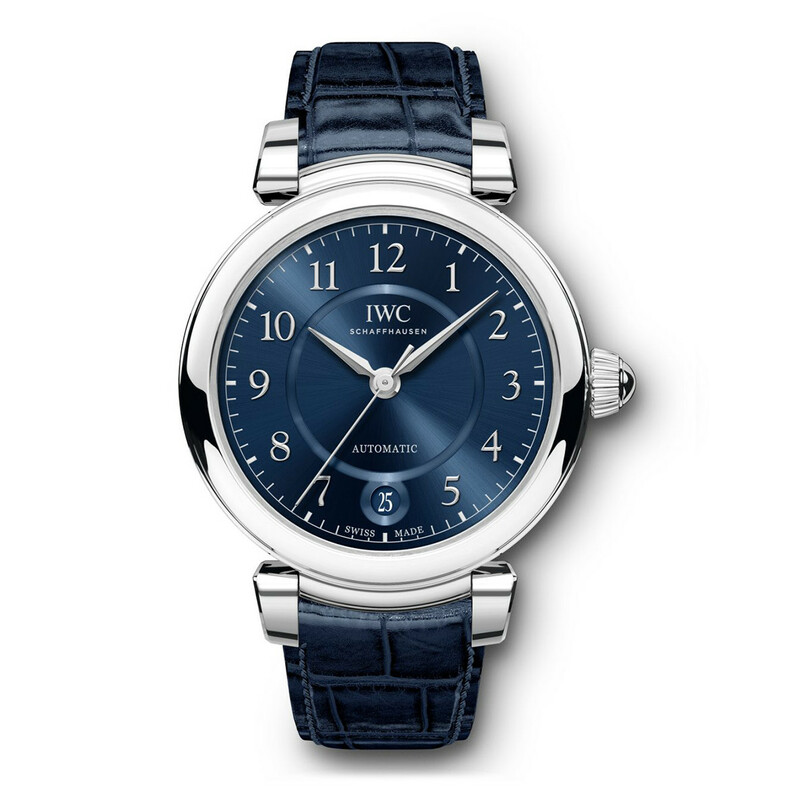 IW459306) features the 35800-caliber mechanical automatic movement with an approximate 42-hour power reserve when fully wound; silver-plated dial; moon phase aperture at 12 o'clock; center seconds hand; and 36mm, stainless steel case on a dark blue alligator leather strap from Santoni secured by a stainless steel three-wing butterfly clasp. With its smaller case measuring only 36mm in diameter, the moon phase complication, dome-shaped crown and exquisite materials, the Da Vinci Automatic Moon Phase 36 is the perfect companion for those who truly appreciate understated luxury. 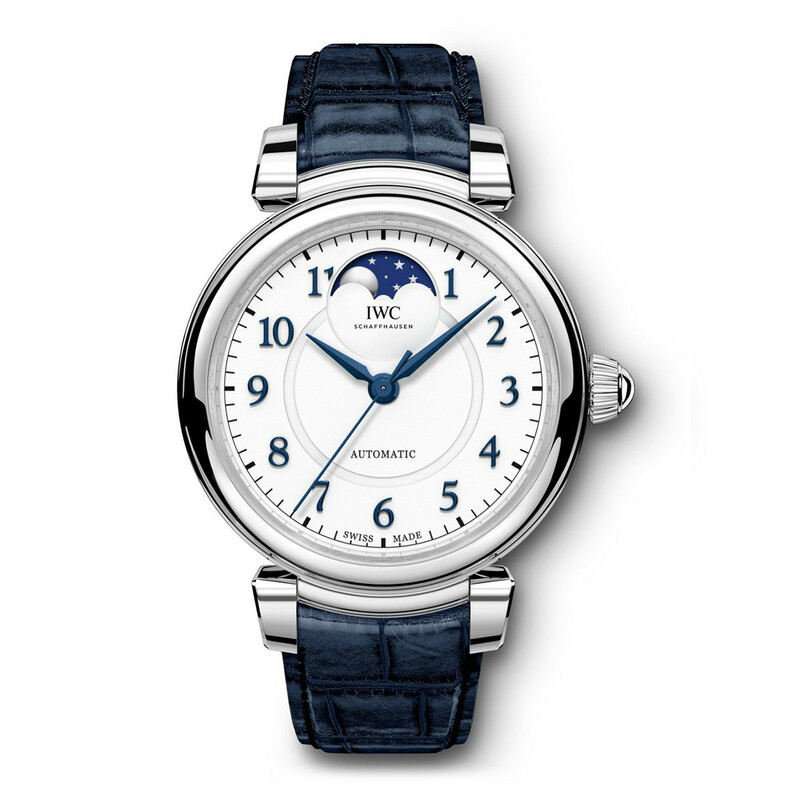 The classic moon phase display with the dark blue night sky and silver moon and stars is an attractive and eye-catching feature on this three-hand watch. The horizon stretches to the recessed inner circle, which lends the silver-plated dial a sense of structure and depth. With the Flower of Life engraved on the case back, IWC pays tribute to Leonardo da Vinci’s tireless search for mathematical rules for beauty and proportions.